SAN FRANCISCO, California, March 3, 2016 (ENS) – A indigenous Lenca woman who was honored with a 2015 Goldman Prize last year for her fight against a destructive dam, was killed by gunmen last night in her home in La Esperanza, Honduras. 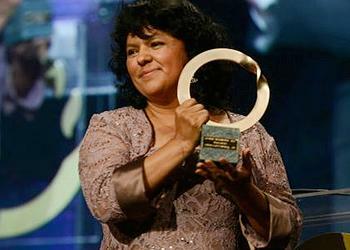 Berta Cáceres won a $175,000 Goldman Environmental Prize for her work to defend the Gualcarque River, its environment and people from the Agua Zarca Dam. If built, the dam would cut off the supply of water, food and medicine for hundreds of Lenca people and violate their right to sustainably manage and live off their land. “On behalf of my siblings Doug Goldman and Susie Gelman, Prize jury, and staff, I’d like to express my deepest condolences to her family, friends, and colleagues at COPINH and around the world,” said John Goldman, president of the Goldman Environmental Foundation, based in San Francisco. “She was a fearless environmental hero. She understood the risks that came with her work, but continued to lead her community with amazing strength and conviction,” said John Goldman. Each year, close to Earth Day, the Goldman Environmental Prize honors grassroots environmental heroes from the world’s six inhabited continental regions: Africa, Asia, Europe, Islands and Island Nations, North America, and South and Central America. Prize recipients focus on protecting endangered ecosystems and species, combating destructive development projects, promoting sustainability, influencing environmental policies and striving for environmental justice. Other Goldman Environmental Prize winners are feeling the loss; they are planning to issue a joint statement in response to her death. “No one should die trying to do the right thing,” said Maria Gunnoe of the United States. “We draw strength from her life and her death to continue her work here,” said Atherton Martin of Dominica. As detailed in a 2015 report from the nonprofit group Global Witness, Honduras is the most dangerous country in the world for environmental activists. Goldman Prize staff is working with Global Witness and other partners to demand that the Honduran government conduct a full investigation into the killing, take immediate measures to ensure the safety of the Cáceres family, and grant protection for activists in Honduras. Cáceres rallied the indigenous Lenca people of Honduras and waged a grassroots campaign that successfully pressured the world’s largest dam builder to pull out of the Agua Zarca Dam. Since a coup in 2009, Honduras has witnessed an explosive growth in environmentally destructive megaprojects that would displace indigenous communities. Almost 30 percent of the country’s land was earmarked for mining concessions, creating a demand for cheap energy to power future mining operations. To meet this need, the government approved hundreds of dam projects around the country, privatizing rivers, land, and uprooting communities. Among them was the Agua Zarca Dam, a joint project of Honduran company Desarrollos Energéticos SA (DESA) and Chinese state-owned Sinohydro, the world’s largest dam developer. Agua Zarca, slated for construction on the sacred Gualcarque River, was pushed through without consulting the indigenous Lenca people – a violation of international treaties governing indigenous peoples’ rights. Cáceres grew up during the violence that swept through Central America in the 1980s. Her mother, a midwife and social activist, took in and cared for refugees from El Salvador, teaching her young children the value of standing up for displaced people. Cáceres became a student activist, and in 1993 she cofounded the National Council of Popular and Indigenous Organizations of Honduras, COPINH, to address the growing threats posed to Lenca communities by illegal logging, fight for their territorial rights and improve their livelihoods. In 2006, community members from Rio Blanco came to COPINH asking for help to resist the machinery and construction equipment coming into their town. They feared these machines would desecrate the river, a place of spiritual importance to the Lenca people. 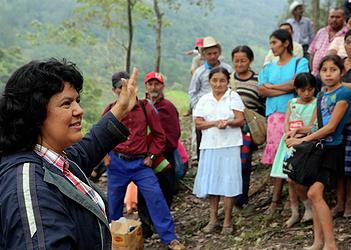 With mandates from local community members, Cáceres campaigned against the Agua Zarca Dam. She filed complaints with government authorities, bringing along community representatives on trips to Tegucigalpa. She organized a local assembly where community members formally voted against the dam, and led a protest where people peacefully demanded their rightful say in the project. The campaign reached out to the international community, bringing the case to the Inter-American Human Rights Commission and lodging appeals against the project’s funders such as the International Finance Corporation (IFC), the private sector arm of the World Bank. Ignoring these appeals, the national government and local mayors forged ahead. “They doctored minutes from a community meeting to paint a false picture of unanimous approval for the dam, and offered cash to local people in exchange for their signature on documents declaring their support,” wrote the Goldman Prize staff in announcing the 2015 award of the prize for Central and South America to Cáceres. In April 2013, Cáceres organized a road blockade to prevent DESA’s access to the dam site. Using an organized system of alerts to keep everyone in the loop, the Lenca people maintained a heavy but peaceful presence, rotating out friends and family members for weeks at a time. For over a year, the blockade withstood multiple eviction attempts and violent attacks from militarized security contractors and the Honduran armed forces. Honduras’ violent climate is well known to many, but few understand that environmental and human rights activists are its victims. Tomas Garcia, a community leader from Rio Blanco, was shot and killed during a peaceful protest at the dam office. Others have been attacked with machetes, discredited, detained, and tortured. None of the perpetrators have been brought to justice. Against these odds, Cáceres and the Lenca community’s efforts successfully kept construction equipment out of the proposed dam site. In late 2013, Sinohydro terminated its contract with DESA, publicly citing ongoing community resistance and outrage following Tomas’ death. Agua Zarca suffered another blow when the IFC withdrew its funding, citing concerns about human rights violations. Today, construction on the project has come to a halt.